Walked aross via the SUP tonight. It is very nice. The boardwalk part on the right (sorry, my phone is not good in low light) starts wide, narrows to the centre, then widens again, making the whole path narrower mid-river. Having to cross the road on the south side instead of the north adds a little bit of time to my walk home but it is worth it. ... but it is worth it. Is the lighting made by a company called Movilume? 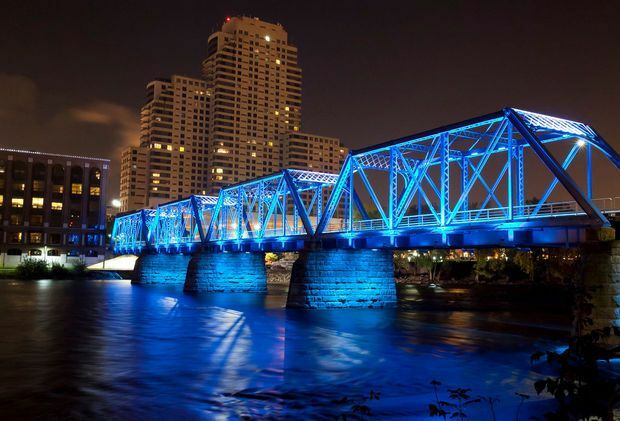 Bridge looks great, what an improvement coming into downtown. Indeed. 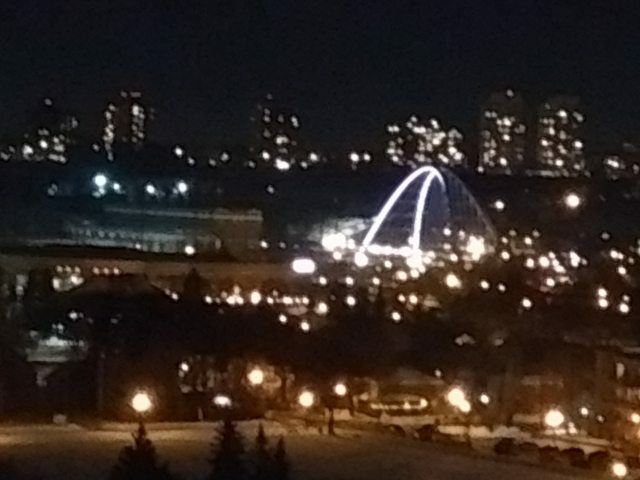 Saw the lights from the top of 105st last night, beautiful. 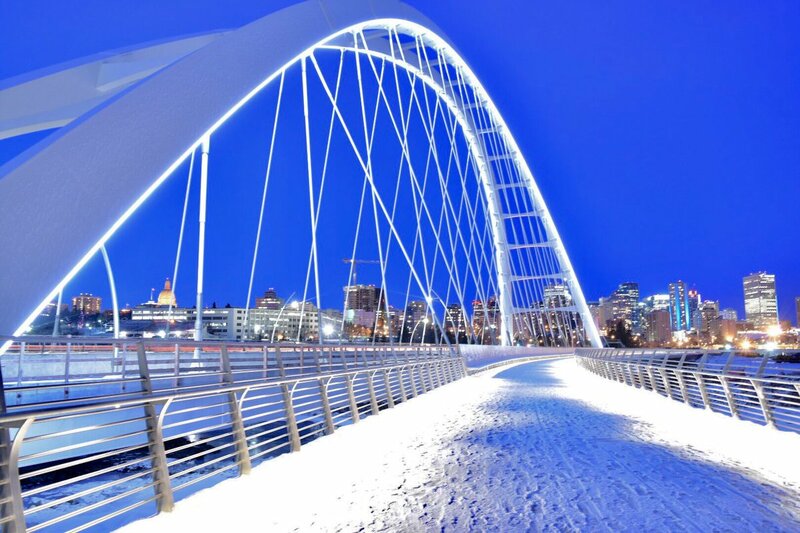 The LED lighting in winter looks great downtown. It brightens up everything on long winter nights. 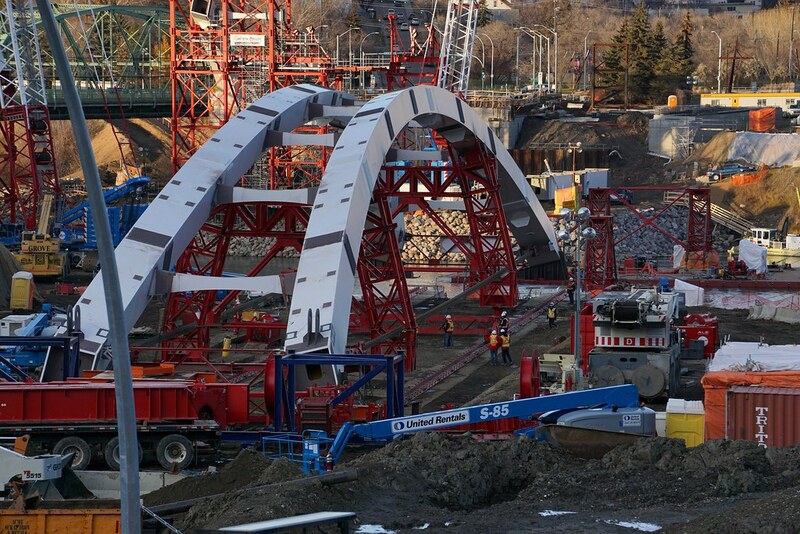 ... just wait until the snow melts and those lights can reflect off the water and back onto the arches! Friends from out of town said that they loved the look and 'big city feel'. Can’t wait to see the access from Kinsmen completed and the surrounding sidewalks connected and landscaping completed. It’s going to be a huge mess come April. Is all that stuff - the landscaping, trail connections, pedestrian walkways under the bridge, berm removal, etc. - part of the bridge contract and therefore way past deadline? Yes the land and trail restoration is part of the project. 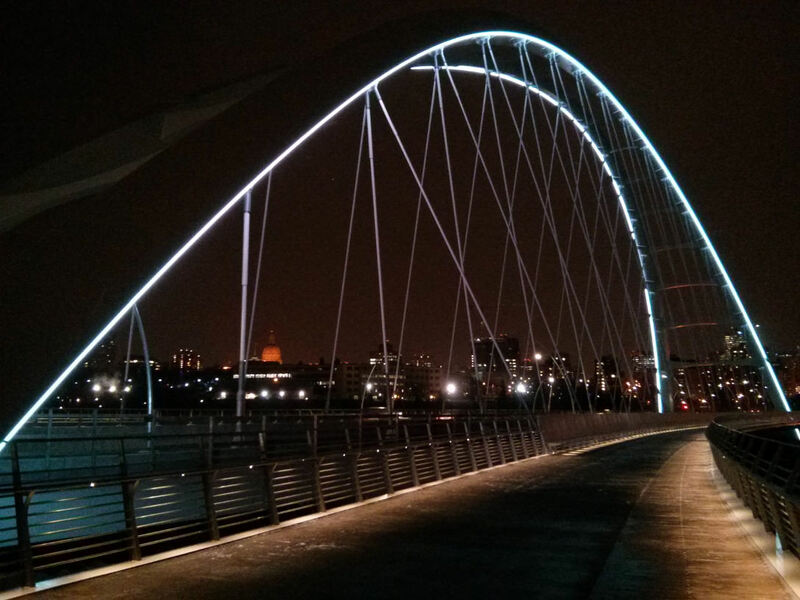 My oh my do I ever love our new Walterdale. Saw this pic on the news. Bianca Millions and Bill Fortier had discussion that this shot could be from the perspective of a troll living under the bridge. Beautiful photo for sure. Last edited by Drumbones; 21-01-2018 at 05:42 PM. Geez, Bianca and the late-weekend-news lady had an unrehearsed chuckle about it last night. Cold day in February. Not spring yet. Looking forward to when the paths are back open. Been closed for so long. Cool video on the demolition of the old bridge. Speaking of demolition, the guys pulling back the northside jetty have been putting in some serious time lately - past midnight, even past 1:30am one night before I had to go to bed. 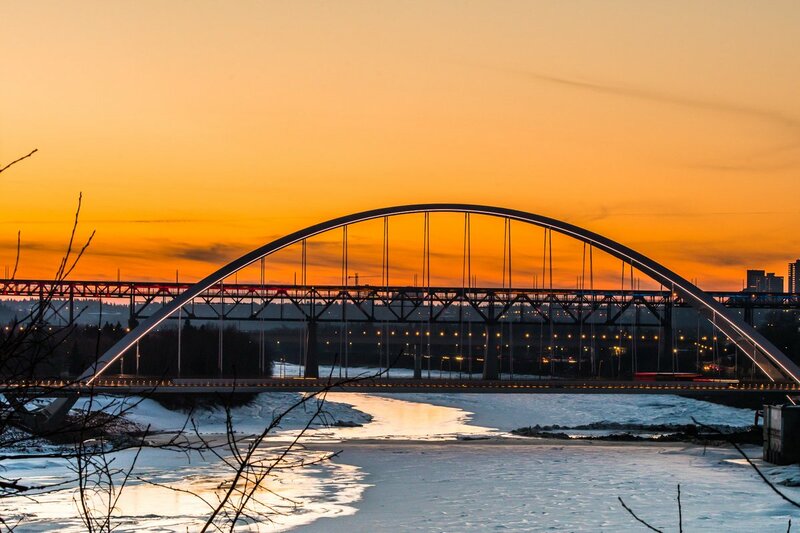 A beautiful addition to the city's river valley that screams for a facility or attraction next to it (cough, old power plant or some appropriate replacement) where patrons can attend events, recreate and otherwise enjoy the view of the lit arch while consuming food and beverages. Last edited by norwoodguy; 20-02-2018 at 09:38 AM. Council will have to study your suggestion. As well, numerous committees and sub committees will have to be set-up to discuss what is a good idea but will have to be shutdown because .... well let's just say because. City council members reviewed initial concept drawings Tuesday and voted to prepare a funding package for debate this fall while setting the next four-year capital budget. 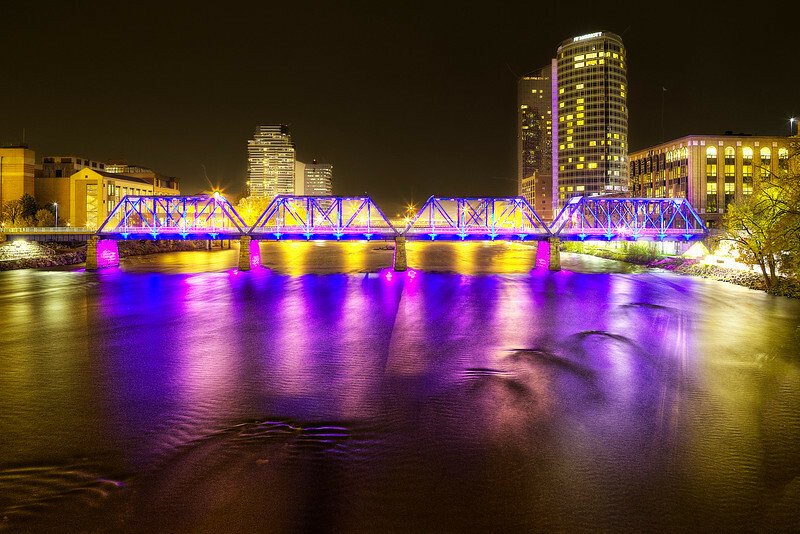 City officials would need funding to consult with the public on the design, check whether they really want more access to the water itself and what kind of development they want in the core reach of the river. 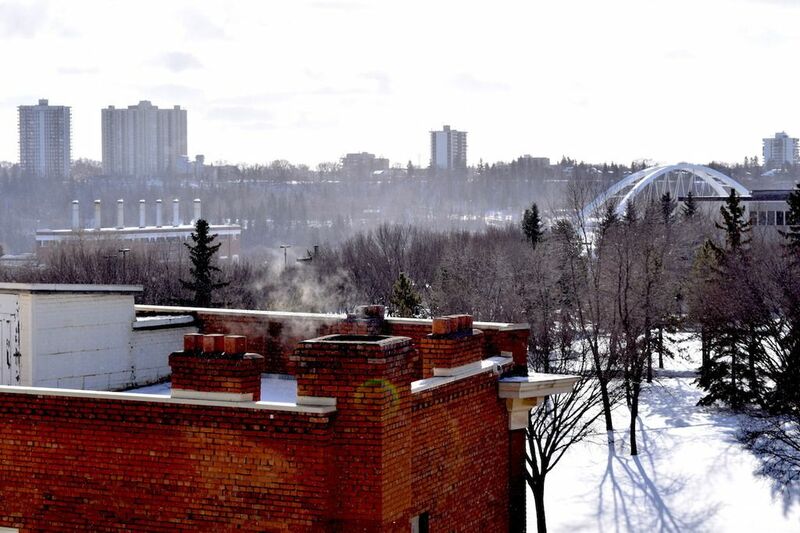 The plan would cover a new walkway for up to two kilometres between the Walterdale Bridge and Government House Park. Something definitely should be done along RVR between 105th and Groat. The multi-use trail is jam packed and could definitely use a split between lower and higher speed activities. Several of the parking lots on the North side of it should have been paved 20 years ago. And for god's sake, stop giving the dilapidated cherry trailer a business license while also building some sort of permanent structure similar to the one at Louise McKinney to house a small cafe and a place to rent bikes etc. Edmonton: a small path is doing well. I hope to gawd something like this happens in my lifetime. At McKinney Park we have to climb down the rocks from the promenade to hit water. Crazy. There's one thing I know, you can be sure they'll go ahead with it no matter what the people tell them. And then when the thousands of trees are mowed down and everything is paved, they'll discover that there's barely any more people going there than before. BTW, the "congestion" thing is an absolute myth. I know because I go there. The congestion on the trail besides river valley road isn't a myth. Sure, it's not always congested, but any nice summer weekend day it becomes quite congested. I ride this path regularly. A separate bike path would go a long way to resolve the near misses. Yeah, not a myth at all. On busy summer weekends it can be pretty difficult to navigate on a bike if you're interested in going any faster than jogging speed. And no, riding on RVR isn't a great option either unless you're in phenomenal shape and on a road bike, being that it's a single lane 60 km/h road with no curb lanes. And that would be the wrong approach. Why not a soft-surfaced walking path that winds around the trees? Cyclists wanting to do 30 km/h stay on the existing trail. Walkers out for a leisurely stroll use the new trail, that is prettier, farther from the road and easier on the feet. How about the existing path for cyclists/rollerbladers and maybe a few very fast runners, a paved walking path AND a granular trail. Not all walkers are out for a leisurely stroll, and not all can handle an uneven surface or one that could be muddy after a rain. Mobility scooters can fit right in on the bike path but wheelchairs don't belong there and don't do gravel. And Why not remove a few trees so people on the paths can see a bit more of the river? This isn't untouched nature we're talking about. Last edited by Highlander II; 21-02-2018 at 12:15 PM. I have been on that thing on perfect summer weekends. NEVER was it so bad that I was like 'oh, this thing should be wider'. All I'm saying is I need a legit study that shows that this single trail is tons busier than the other trails to the point where it needs expanding. But even then it doesn't matter, because even if it did they could easily do that without resorting to what they're suggesting. I agree - we don't need to go to the full out vision we have seen for this so far, if we are only looking at it from a capacity issue. The other part of this is to bring people closer to the water. Again - we don't need to go as far as some of the renders have shown us about this - but that's just a quick artistic vision of what could be possible. This is the beginning of a plan to be built with input from anyone that wants to give input. I think what we have now in this section barely works. Improvement can be made, and if the city has an appetite to make changes in the area, lets look at what everyone wants to see done with this area, and then go from there. Another thing that's under-reported is just how 'out of the way' this trail is. It doesn't connect to downtown. You literally have to drive your car to Kinsmen (which I do) or Victoria Park to go there. There is already ample parking that exists in order to use this trail, but that doesn't necessarily make people go there. So what will? 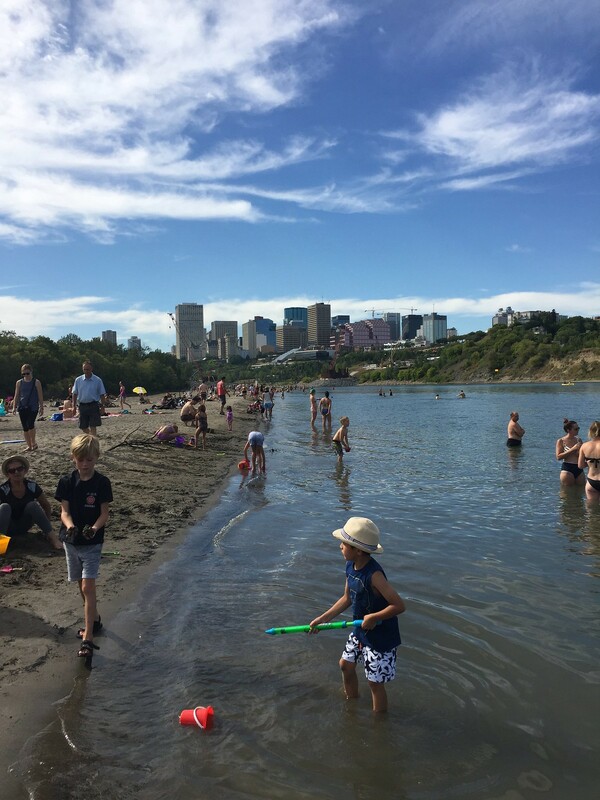 Well, apparently the politicians believe that everyone in Edmonton is just craving access to the muddy brown water of the North Saskatchewan. I regularly walked there when I lived in Oliver and Grandin, there are a few decent stairway connection although it could be better. I still sometimes cycle there now that it's 10km away not as a destination but as a nice part of a nice ride. NEVER was it so bad that I was like 'oh, this thing should be wider'. Odd, because just about any time I use it on a nice weekend in the summer (which is frequent), that's exactly what I'm thinking while trying to navigate around families walking 4 abreast who don't respond to a bike bell. As far as connectivity goes, while it may not be well connected to downtown, a ton of people from the West end (Laurier, Glenora, Crestwood, Parkview and so on) use it for bike commuting and plain recreation. The entire stretch of multi-use path from 149th street to the Menzies/RGC is very, very well used and can be dangerously congested given the large delta in speed between walkers going 5 km/h, joggers/rollerbladers going 10-15 km/h, mountain bikers going 20-30 km/h, and road bikers going 30+ km/h. Last edited by Marcel Petrin; 21-02-2018 at 01:35 PM. Give access and the people will come! 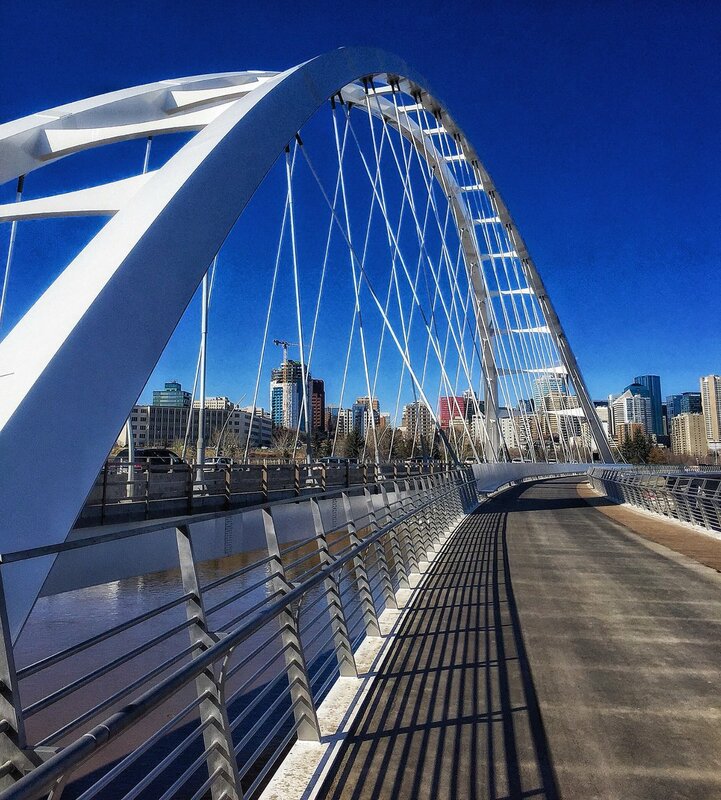 Meanwhile we have wide, very wide pedestrian bridges at multiple locations in Edmonton. We also just built an expensive funicular with only a limited vista. These are designed to allow people to linger, enjoy the views and meet with others. The HLB narrow pedestrian access is not suited to this. I think that the HLB upper deck is the most underutilized tourist and resident attraction that is barred from use. Wow, this trail is not at all out of the way. I'd guess that this is one of the most used trails in the river valley. 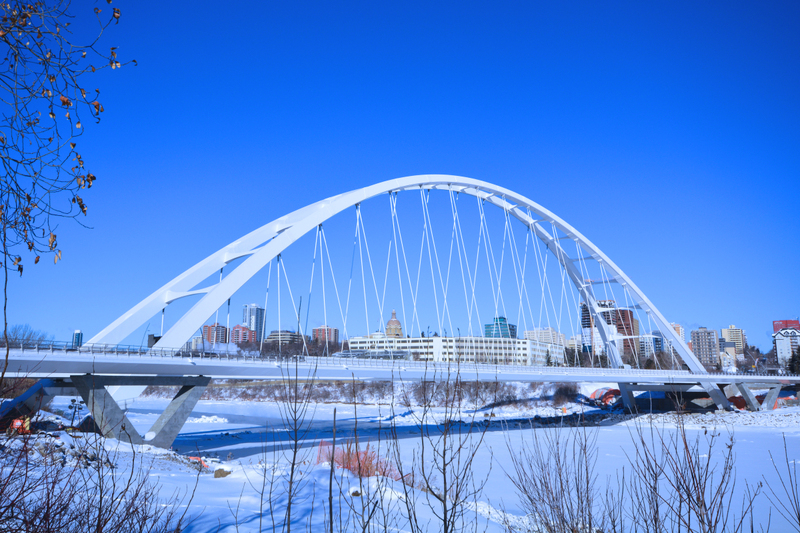 It does connect to downtown, via the trail that goes up behind the Royal Glenora Club, or the many stairways, or the trail that goes up to Victoria Park Road (which turns into 100th avenue.) The trail also is a vital part of the river valley network of trails which stretch from Clareview to Terwillegar. The parking lots are often busy - are are also for the parks on the other side of the trail that are not part of the golf course. The river looks muddy in the spring, and after heavy rainfall, but can be quite clear at other times during the summer. I'm not sure why you are so opposed to what's happening here. I think people are conflating the RVR trail & the "Touch the Water" trail upgrades. Well it doesn't help when the Mayor when talking about this on the news mentions people wanting to 'touch the water'..
Ugh. I hit enter too soon. I meant to say RVR/Touch the Water vs the paths that directly connect to the Walterdale & deal with the area around the power plant, hence the "drive to Kinsmen" part. Wow! I never thought i would see this in our city. Fantastic upgrade from what used to be there! On the east edge of the bridge - not on the curved walkway but beside the road - there is a temporary wooden railing. You can see it clearly in Medwards' comment #3548. On the north end of the bridge there are a few metres of permanent railing in the style of the rest of the bridge. That won't be another walkway, will it? The bridge is beautiful, as are so many of these pictures. Regarding the RVR walking trail, I think it's obviously over due for upgrades. This is the perfect time to start the process. The Groat Bridge is about to be rebuilt, so the west end of the trail will be disrupted for 2-3 years. Start consulting now, figure out whats needed and wanted and then tie the work in with the completion of the Groat project. I think that is an optical illusion. It looks like street lighting luminating on that area as the rest is darken. Anyone know why the bridge is the same static color all the time? I know they were testing multiple color schemes early on (pics in this thread I believe) but since completion it's consistently been the one solid white. Ugh. It’s got so much aesthetic potential but the ridged edges of those plates continue to take away from the final look. Why did the refuse to weld them to the top? The lights make a huge difference. the “sigh” should be reserved for their existing to be mentioned instead of the mentioning. they are a constant reminder of the “good enough” that is still too much a part of how things are done here. are we doing better things and doing them better than in the past? 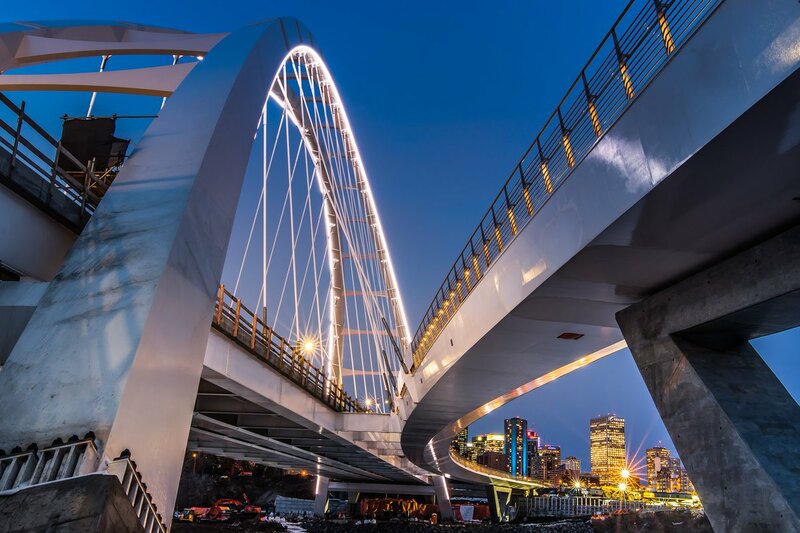 absolutely and the walterdale bridge is a good example of that. but it is unfortunately also a good example of how easy it is to compromise that. hopefully it won’t also be a good example of how we don’t do maintenance any better than we do execution because those plates and exposed bolts will be the first place that will be on display as well. Last edited by kcantor; 06-04-2018 at 06:33 PM. the “sigh” should be reserved for their existing to be mentioned instead of the mentioning. they are a constant reminder of the “good enough” that is still too much a part of how things are done here. are we doing better things and doing them better than in the last? 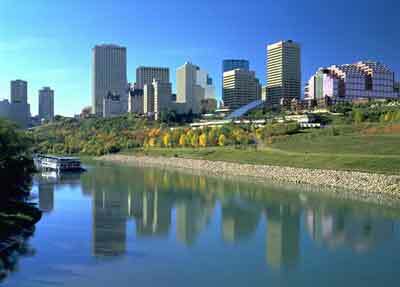 absolutely and the walterdale bridge is a good example of that. but it is unfortunately also a good example of how easy it is to compromise that. hopefully it won’t also be a good example of how we don’t do maintenance any better than we do execution because those plates and exposed bolts will be the first place that will be on display as well. Do you think it was, "the good enough for Edmonton" issue? I think it is more as poor decission makers at the city's administration level. 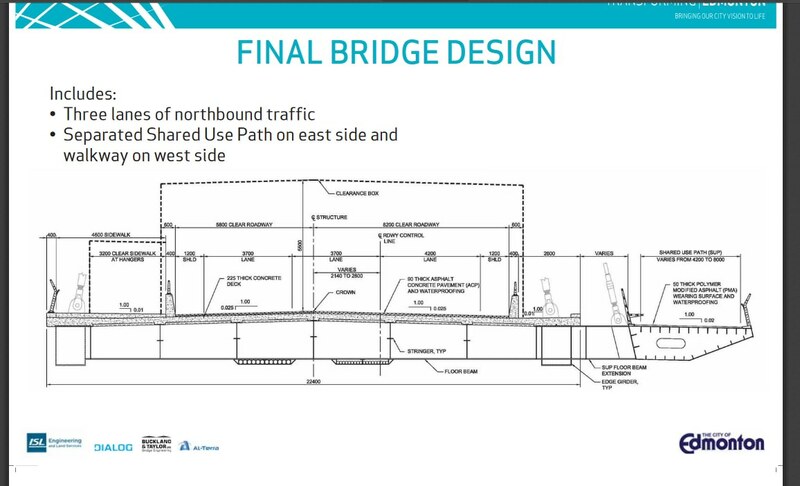 This project ran within the same time span as the same bosses that over saw the bridge at Glenora/Groat; they are the same people that over saw the LRT stretch from Churhill to NAIT. Was it a case of too many projects at once; or, was it it incompetent leadership? 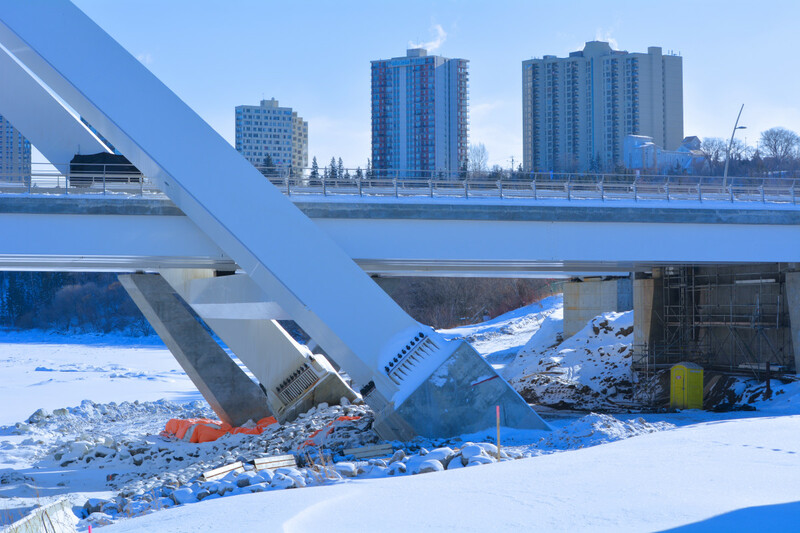 I cant answer that, but I do recall this bridge commenced within the same time span as the other two mishaps.From my perspective, i think it was a culminated factor that caused this. While I'm not bothered by the plates, i do empathize with the principle of details especially for this design. It could have been MORE. unfortunately i do think it exemplifies a “good enough” philosophy. i don’t think it’s a matter of people consciously trying to decide how much doesn’t have to be done because it’s edmonton but i do think it’s a culture that simply doesn’t pay enough attention to the details that, at the end of the day, make all the difference. it’s a culture that seems to treat good intentions as sufficient enough to overcome poor execution. there’s a lot of truth in the old maxim that says “the devil is in the details”. it’s not just the devil that’s in the details, everything is in the details. And another old maxim is: If a job's worth doing, it's worth doing well. To me, that includes the aesthetics. Unfortunately, a large portion of Edmonton has a utilitarian attitude. while that might have been true one day, the more i think about the old courthouse, the carnegie library, the macleod building, the canada permanent building, the strathcona library and post office, the goodridge and gibson and gibbard and brighton blocks, cn tower, city hall, the hemingway pool, etc., the less i believe that. it’s almost as if driving on pothole filled roads alongside unkempt boulevards and over rusted out bridges day after day after day somehow wore us down. as more and more people travel more and more to places that doesn’t happen and as more and more people living here came from somewhere else - what it would it be now - half our population in the last two decades? - many of these things are becoming less acceptable. someday having a school of architecture to go along with engineering and planning will provide technical expertise to culturally pay attention to those details once again. "NO more Crap" is a famous one. I believe it was "No more crap - Arcitecture must improve!". Way back in the summer of 2005. A nice sentiment, but one that 7 years later, can't really be said to have improved dramatically if residential condos built since then are anything to go by. I think you covered that grey area quite well. Two recessions and two+ decades without much allocated funds to proper maintain and expand infratuctures all remedied with a hail Mary pass to current scenarios where we are forced to catch up and build all at once. The problem is we lack experience at some level along administeation that should have knowledge of the task at hand. Do we currently have the right personels for the job going forward...? I don’t think it can work as you expect. Everything is always in flux. Council’s change, priorities change, economics change, opportunities arise and disappear, etc, etc, etc. Staffing could be right for a brief moment in time but this isn’t a production line. Approvals get delayed, demands for stakeholder discussions push out time lines. Issues like problems with construction (bridges, metro...) force rethinking of previous decisions assumed to be problem free but instead turn out to be near calamitous. Contractors facing their own problems see their expected profits vanish and reassess all future project risks they face and costs across the board change affecting all budgets causing cut backs or sometimes advances. Plus key staff tire of waiting for the debating to end, they move on or retire before their skills are called on. Or an economic bubble comes along and critical staff suddenly get poached by the private sector. Or a recession comes along and public demands for cost controls and a hiring freeze drive a stake through any type of continuous improvement possibilities. It’s got to be like fighting a war where everyday some new crisis arises and moral is continually driven into the ground. Last edited by KC; 07-04-2018 at 10:41 PM. Hate to bring it up, but those plates look like crap in person. More patches than a potholes road in Edmonton. Substandard execution of a nicely planned bridge. Why do we accept a mediocre work at a luxury price on a signiture project? Yeah, I know... sorry, but it really struck me. The thing is that this can still be fixed. The joints can be welded and the plates can be removed. I don't know who allowed the design specifications to be changed in the first place. Super picture, thanks for posting it. 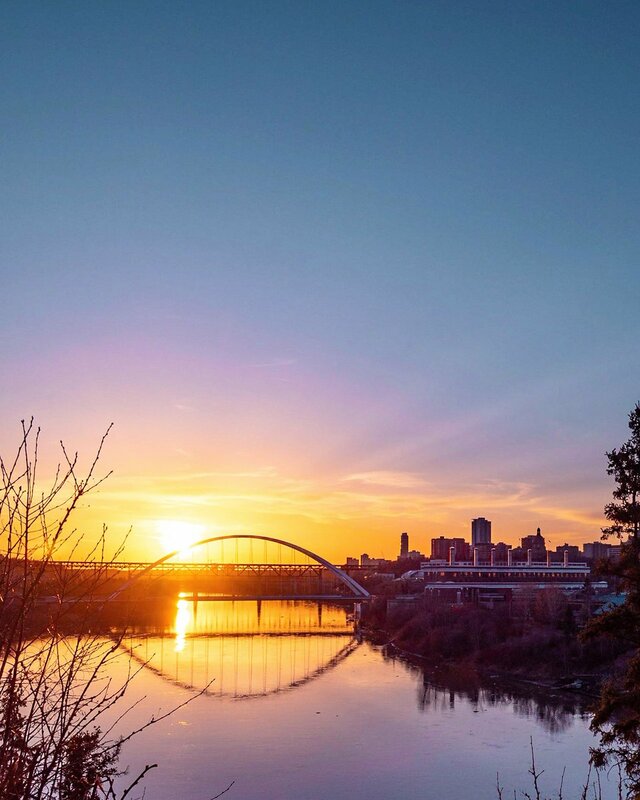 Last edited by Edmonton PRT; 30-04-2018 at 05:16 PM. 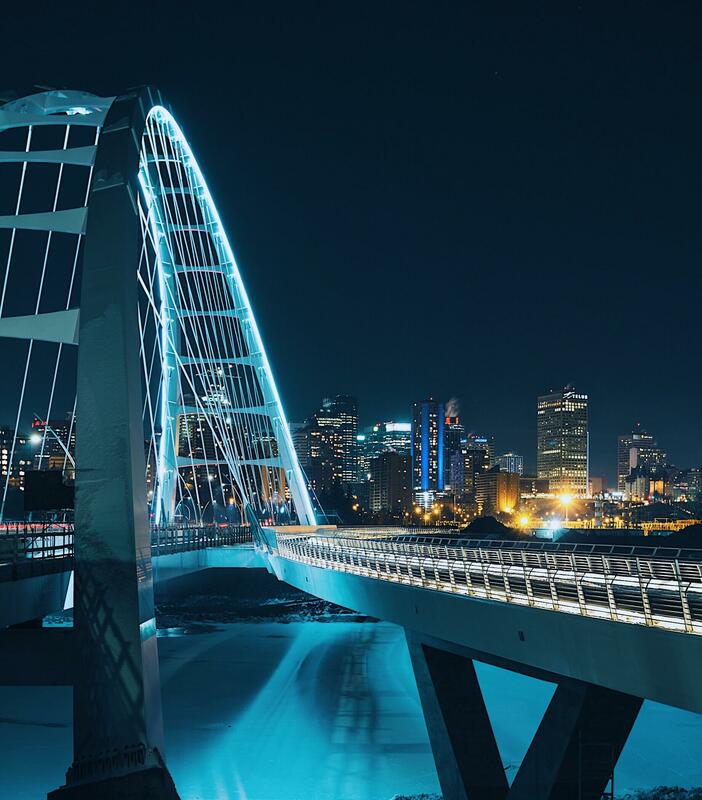 The Walterdale and the Ice District sure change the perception of downtown. MUCH more modern/big city feel. I wonder why they didn’t make them round or of a style in keeping with the concavity of the cross braces. They weren't supposed to be there at all. When you get a new home built, wouldn't you want shingles on the roof? Would you accept a tarpaulin instead because the builder said it was too high to install shingles? Why would they not have welded the joints when it was still on the ground? Rushing the job and cutting corners is just deplorable. If the photos didn’t show vents for plumbing stacks, garage furnace chimney, etc. but the final product had them, that’s how it is. Most drawings don’t show bolt heads, seams, etc. either. Plus if the buyer was going to penalize the builder for any and all delays then don’t expect the best work. When we did our house renovations we made it very clear to the general contractor that we didn’t mind delays or added costs to do it right and that we were not going to hold him to his original quote. He did a great job and even talked us out of spending money on a feature that we are now glad we didn’t do. Last edited by KC; 13-05-2018 at 08:33 AM. The design was not to include ugly bolted plates. So 19th Century for a 21st Century bridge. It is just plain wrong and you know it. i can show you a roof plan for the brighton block that shows every plumbing stack and roof vent and gum box and access hatch and tie-down. i can also let you know that they’re sited not to be visible from the street and where visible from above will at least be arranged as much as possible to present a proper and not a random placement pattern. furthermore, if these connections didn’t show up on the design drawings, they would have been identified in the book spec and detailed on the shop drawings before they were submitted for approval. Last edited by kcantor; 13-05-2018 at 10:37 AM. If I were a councillor I’m sure the first thing I would be doing is exploring the costs to remediate these plates. 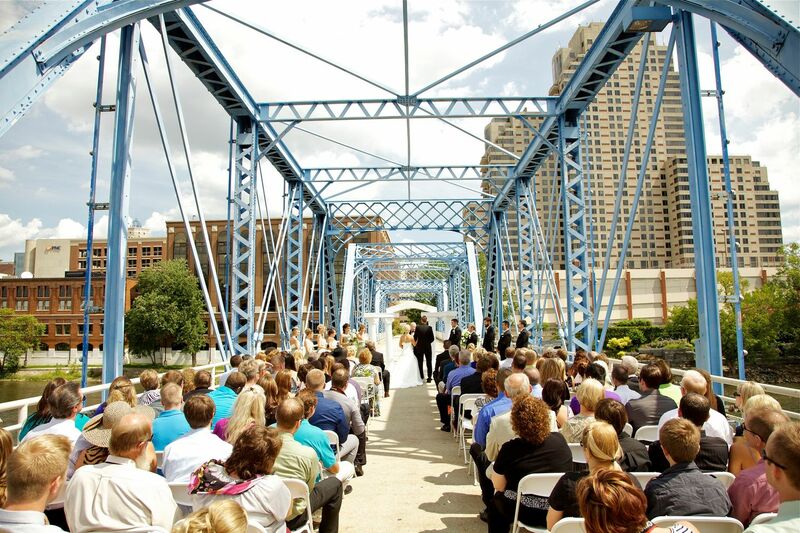 It’s going to look absolutely horrible once oxidation sets in around the plates and the bridge becomes stained.